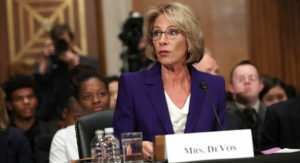 Home » Posts Tagged "DeVos"
Full Senate to vote soon on Betsy DeVos for U.S. Secretary of Education. Republican Senate colleagues like Alaska’s Lisa Murkowski have indicated that Betsy DeVos will be BAD FOR RURAL SCHOOLS. Kansas is a largely rural state. Betsy DeVos is unqualified, facing accusations of plagiarism and has misstepped on basic issues like Special Education. Having Betsy DeVos run the U.S. Department of Education would be like appointing a former official from PETA (People for Ethical Treatment of Animals) to run the Kansas Livestock Association. Her experience and personal agenda are incongruous with the position she is seeking. Tell Senator Moran to stand with Kansas public schools and to vote NO on Betsy DeVos! CLICK HERE to contact Senator Moran now! ALSO, call him and leave a message at one of his offices. It’s working. You’ve sent more than 800,000 emails to senators, and called their offices more than 32,000 times, demanding that they reject Betsy DeVos’ nomination to be secretary of education. Now the Senate Education Committee has delayed their vote. Senators are being inundated with your emails and calls, and they’re looking more closely at DeVos’ clear and demonstrated lack of knowledge of public education, and at her concerning ethics disclosures. Step 1: Email your senators. Keep up the drumbeat that DeVos is completely unqualified to be put in charge of our nation’s schools. Step 2: Call your senators at 1-855-882-6229. Make sure they feel the pressure in Washington and in their district offices. Step 3: Share this post on Facebook. Spread the word that you don’t want DeVos to be confirmed, and ask your friends to contact their senators, too. 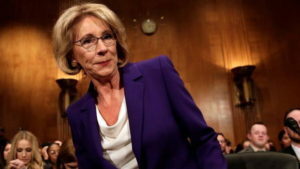 Donald Trump’s nominee for Secretary of Education, Betsy DeVos, will get a hearing before senators this week (Wednesday, January 17th). Let’s take a closer look at this surprising pick—a lobbyist and political donor with no education experience. DeVos has never served as a teacher, a school administrator, or a school board member. DeVos’ track record of using millions of her own money to support for-profit charters and private-school voucher programs that divert taxpayer dollars away from public schools signals to parents and educators that they need to be on guard. DeVos has been described as a “four-star general in the privatization movement.” Below are four reasons why. DeVos and her husband, a member of the family that made its fortune selling Amway products, contributed millions of dollars to voucher campaigns across the country. In 2000, in their home state of Michigan, they spent $5 million on an unsuccessful bid to remove the state’s constitutional ban on vouchers. Sixty-eight percent of voters rejected the DeVos’ voucher scheme. DeVos has been described as “one of the architects of Detroit’s charter school system”—a system that even pro-charter forces describe as “one of the biggest school reform disasters in the country.” Charter schools are privately managed, taxpayer-funded schools exempted from some rules applicable to all other taxpayer-funded schools. The unchecked growth of Detroit’s charters has outpaced the student population and is failing the city’s kids, who are among the poorest in the nation. According to a recent report, 8 in 10 charters had academic achievement below the state average in both reading and math. The city’s glut of charters has also created a situation where the competition to recruit students—and the public dollars that follow them—is extremely intense. Charter companies have resorted to offering cash bonuses, laptops, and iPads to families to get students to enroll. Educators say the competition and the limited amount of resources available have created an environment where very few students can thrive. In 2011, the DeVos family successfully lobbied to lift Detroit’s cap on charter schools and managed to kill off a provision that would have prevented failing charters from expanding. After the cap was lifted, several charter companies opened up new schools even though they already operated schools deemed to be failing. In 2016, the Great Lakes Education Project, which is founded and funded by the DeVos family, was described as being instrumental in getting state politicians to kill a plan to create a citywide commission in Detroit to regulate the opening and closing of charter schools. City leaders said the commission would have provided oversight, set standards on how to open charters and close the bad ones. Contact your U.S. Senators and tell them to reject the DeVos nomination. Tell lawmakers that educators believe all students have the right to a public education that helps them reach their full potential, and their opportunity to succeed should not depend on winning a charter-school lottery, getting into a private school, or living in the right zip code. Our kids deserve the best America has to offer—including an education secretary who understands that all students deserve a quality public education.